I’m proud to call Chicago my home for many reasons, one of which is its dedication to the arts. And parents will be happy to learn that Chicago is home to a wonderful variety of family-friendly art museums just perfect for kids of all ages. From stroller tours to interactive arts programs, kids are able appreciate art from any age. 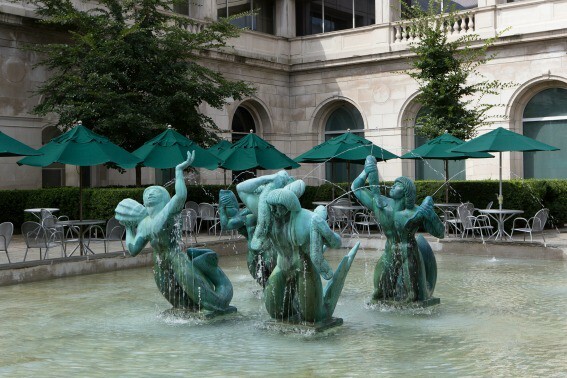 So grab your budding artists and scope out these family-friendly art museums. As one of the best museums in the world, The Art Institute of Chicago also happens to be one of the best for kids. With over 300,000 works of art to see, it may seem overwhelming to visit with kids, but the museum makes it easier by providing families resources to make your visit a success. Start your visit at the Ryan Education Center (free!) 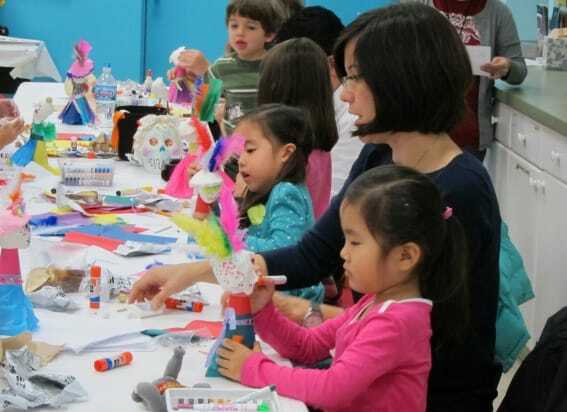 where kids can learn about art with hands-on activities. Assemble puzzles from the masterpieces they’ll see in the galleries, play with blocks, or browse through over 1,300 picture books. Looking to create art? Kids can express their creativity at the Artist’s Studio or participate in a workshop. Ready to explore the rest of this art museum? To enhance the experience, be sure to grab a free family mini-tour guide before exploring the galleries. Tech-savvy parents can even download an app! Some kid-friendly experiences include touching art at the Elizabeth Morse Touch Gallery, examining the Thorne Miniature Rooms in detail, and viewing the colorful paperweight collection. A must-see is their newest art exhibit, Van Gogh’s Bedroom, where for the first time in North America, all three versions of his painting are together in one room. Bring the kids – the exhibit happens to be one of their most interactive exhibits to date. Tip: When the weather is nice, follow up your trip to the Art Institute with a visit to Millennium Park and Crown Fountain, just across the street. Free strollers are available for use in the museum. See what families think of The Art Institute of Chicago. Another great family-friendly art museum is the Museum of Contemporary Art. Their belief is that it’s never too early to enjoy contemporary art and they have two great programs to help accomplish their mission. On the second Saturday of the month, the museum hosts Family Day with open-ended activities inspired by current art exhibits. The activities are meant to involve the entire family as they work together. Family Days grant free admission for the entire family with children 12 and under (October-May). Worried about bringing tiny tots with you? Put your worries to rest and join their popular monthly stroller tour. Docents will guide you and your littles as you explore the galleries. Stroller tours are free with museum admission and take place on the first Wednesday of each month at 11:30 am. Tip: The museum encourages visitors to talk, laugh, and share ideas when looking at the art. No need to be quiet here! Hurray! Families will adore the colorful National Museum of Mexican Art located in the heart of Pilsen. With five galleries to explore, kids and parents won’t feel rushed to see everything and can view the exhibits at their own pace. Even if you don’t see everything you wanted, admission to the museum is free, so a return visit can be planned. Consider a visit on Family Sundays when families can join a gallery tour and participate in hands-on art programs while learning about Mexican art and culture. These engaging sessions are tied to the museum’s exhibits to enhance your learning experience. Don’t forget to visit the gift shop for authentic souvenirs from Mexico. Kid-friendly events throughout the year include: Día del Niño celebration (April), their Community Fiesta (June), and annual Day of the Dead events (Sept – Nov) that include decorating sugar skulls and creating altars and ofrendas. Tip: Need a break? Grab lunch at any of the nearby restaurants (try La Cebollita and 5 Rabanitos) or walk next door to Harrison Park for some playground fun. Find more things to do for free in Chicago with kids. 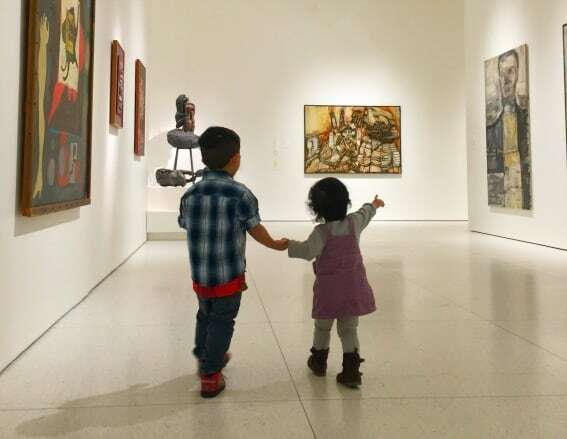 Located in the heart of The University of Chicago campus, the SMART Museum of Art truly makes art accessible for their youngest guests. 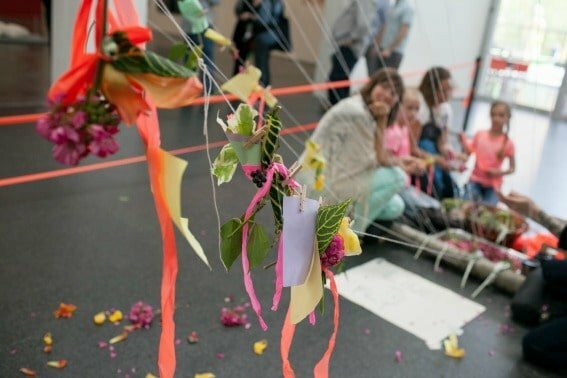 On the first Saturday of the month, the museum hosts a free Family Day where kids can participate in hands-on art projects highlighting current art exhibits. After creating their masterpieces, kids and their families can join a docent-led tour or listen to a story being read in the art gallery. Tip: In the area already? Stop by the Oriental Institute Museum to see mummies and amazing artifacts. Need a place to stay while embarking on your art-filled Chicago tour? A couple hotels are celebrating “Van Gogh’s Bedrooms” with fun packages. 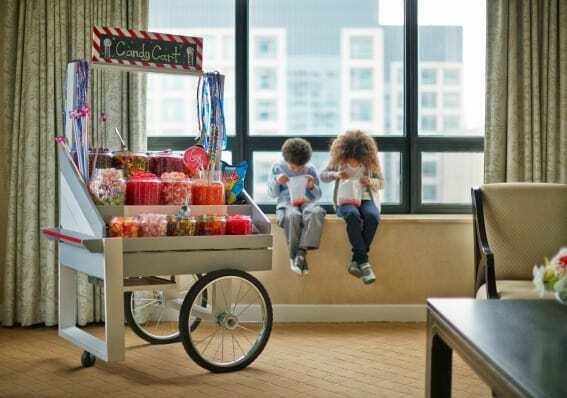 The Ritz-Carlton, Chicago knows how to treat their youngest guests with their Ritz Kids program; think welcome wagon with choice of toy, a candy cart, and cupcake decorating. The luxurious hotel celebrates Van Gogh with an “Explore Your Inner van Gogh” package, which includes overnight accommodations, two VIP tickets to The Art Institute of Chicago’s “Van Gogh’s Bedrooms” exhibit, adult and kid’s coloring books, $50 credit to their restaurant and/or spa, and overnight valet parking. Rates start at $339 through May 8, 2016. Have you stayed at the Ritz Carlton Chicago? Let’s hear about it. Fairmont Chicago, Millennium Park is celebrating the arts with its new Van Gogh to the Fairmont package. This package includes two VIP tickets to Van Gogh’s Bedrooms Exhibit at the Art Institute and overnight accommodations for two. Packages start at $209 and are available through May 10, 2016. 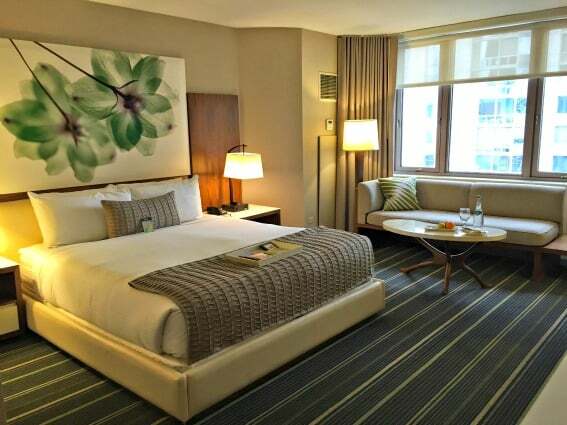 Read reviews about Fairmont Chicago, Millenium Park. Looking for more art-museum resources for families? Ready to explore? 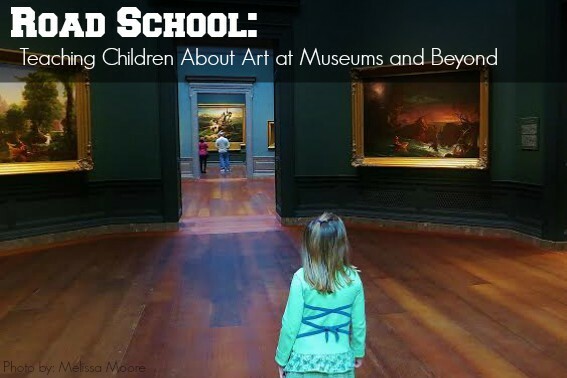 Arm yourself with our Road School guide to Teaching Children about Art at Museums and Beyond before your next museum visit. It’s got tips, recommendations, books and resources to teach kids of all ages to become art explorers.